A very good friend came to my house, made a mess of my kitchen making pumpkin muffins and left me with tons of leftover pumpkin meat. The nerve! So, what did I do? Make pumpkin cupcakes, of course. This is a relatively simple recipe, easy to do, but yummy none the less. Very much like a carrot cake, the pumpkin flavor is subtle and the spices stand out. The cupcakes are not very sweet so the addition of the white chocolate is nice while not being overbearing. I topped them off with a standard cream cheese frosting from a recipe that can be found elsewhere on the blog. Vegan Cupcakes Take Over the World is a new and unique cupcake cookbook with all vegan recipes. I contributed a recipe for vegan lychee-coconut cupcakes that can be found on page 122. I haven’t received my copy yet, so I can’t tell you much more about it, but I am really looking forward to checking it out. For those of you that have asked about dairy or egg-free recipes, this is the cookbook for you. I also hear that there are some gluten-free recipes as well. I got an email about a new product. I rarely mention these types of things on the blog, as there are other venues for that, but I am terribly excited about this one. The Cupcake Courier seems like the perfect answer to, “How am I going to get a load of cupcakes to work without damaging them?” Normally I buy the disposable, plastic cupcake containers, but still need to find an appropriately sized bag, etc. I am really looking forward to seeing how well this works for carting cupcakes on the Vespa. 1. Cut open a pumpkin, take out the seeds and inner flesh, then chop into manageable chunks. Grate the pumpkin chunks, skin and all, with a box grated or food processor until you have four cups of grated flesh. 2. Measure the flour, baking soda, baking powder, salt, cinnamon, allspice, and nutmeg into a medium sized bowl and whisk to combine. 3. Measure the sugar, oil, eggs, and vanilla into a large size bowl and stir to combine. 4. Add about a fourth of the dry mixture to the wet and stir to combine. Continue adding in fourths until all the dry is incorporated. The result with be a very thick batter (and a sore arm). 5. Fold in the pumpkin and chocolate chunks into the batter and scoop into cupcake papers about 2/3s full. 6. Bake at 350 degrees for about 25-30 minutes or until a cake tester comes out clean. 1. Top cooled cupcakes with cream cheese frosting. 2. I decorated the cupcakes with store bought pumpkin candies for the sake of time (and because I actually love/hate those both those and candy corn), but you could always get creative with marzipan if you have the time and inclination. Wow! Not only do these sounds amazing they look fantastic! Really gorgeous work here. These look absolutely gorgeous! The little pumpkins, the details that you put in, really stand out. These are absolutely stunning! And what a wonderful combination of flavours going on inside the cupcake! So what do wannabe cupcake bakers substitute if they’re too lazy to actually grate their own pumpkins? These are adorable, and they sound delicious. I think I’ll be making these for Halloween! :o)for halloween, i’m going to make the infamous kitty litter cake–complete with litter and poops! These tasted amazing! Thank you so much for sharing! My husband ( Fred) brought one home from work. I love cupcakes and these were such a treat! These look and sound fantastic! Thanks for sharing. Same question as #5 and how did you get the cream cheese to work with the pastry bag? Cream cheese seems so thick/not soft. Thanks! the frosting is gorgeous!! what kind of tip and technique did you use? Once again THANKS for sharing your art- you are AMAZING! Can I subsitute pumpkin puree rather than using freshly grated pumpkin? I made these yesterday and they taste amazing! Totally worth grating a pumpkin for! So lovely and so yummy looking. I have been trying some of your recipes and everythng has come out really well! Thank you for sharing with all of us! I really like pumpkin rolls and such so I think that this recipe will be fabulous! Can’t wait to try it! :) BTW, I love all your pictures! Great shots! Love your blog. I’m inspired. Thanks! i just stumbled onto your blog…fantastic work! i definitely would come back again! You are spectacular! You answered all my baking Dilemmas. Thank you. I’ve tried a few of your recipes and love your blog. I recently made cupcakes for my cousin’s bridal shower and had to haul 4 dozen cupcakes! I found some great Oneida cupcake carriers from Linens N Things that carry 24 for $20 and they are awesome. I carried them around with no problem. I don’t recommend substituting canned for fresh in this recipe. Sorry. My sister and I were inspired to make cupcakes today. The cupcakes turned out fine,but the icing went wrong. We decide to follow a basic buttercream icing, with just butter, milk and sugar. It just doesn’t turn out creamy like yours in the picture. It seems to turn out like a sugar paste with butter as a flavour. Our cupcakes are still unfrosted. We’re trying to figure out the problem. Can you help us as to why it turns out like this? are you sure you are looking at a picture of buttercream? cream cheese frosting is creamy… this recipe uses cream cheese frosting. buttercream is thick, sweet, and buttery flavored. if you followed the instructions (and let the butter come to room temp) then it should be fine. maybe you just don’t like buttercream! I haven’t used any pumpkins for baking..but when you cut the chunks..are you cutting it with the rind too? I’m..confused about that. All I remember is that the inside of a pumpkin is all wet and ..’hairy’ like..so then you take out the wet insides and literally cut the pumpkin into chunks, right? By the Way for the folks asking about canned… http://cupcakeblog.com/index.php/2005/10/ginger-cream-filled-pumpkin-cupcakes-with-chocolate-ganache-frosting/“>This other recipe is very different and designed for canned pumpkin versus fresh. I referred to this recipe’s frosting, without the mint extract. I think the sugar might be the problem. We didn’t get powder sugar so we blended our castor one instead. It seems really fine, but still has that little crunch in it. I should be completely smooth, right? i love your site… everything looks gorgeous… where did you buy the pumpkin candy from ? I’m brand new, fresher then fresh to baking cupcakes. Belchinator, You absolutely MUST use powdered sugar and not castor or extra fine sugar. I don’t know of any home tools that can get granulated sugar fine enough to substitute. Puja Pawa, I got them at my local grocery store, Safeway. How adorable are these?!? Happy early Halloween! Okay Chockylit, I will definitely try that the next time. I tried icing sugar, but its still the same. Oh yeah, and after mixing it all, after a while, there are some small yellow stuff that appear, even though i have put some colouring. They look like those things floating on the surface when you melt butter. Thanks so much for answering my questions! I made these yesterday. They came out great. I actually cut the recipie in half because the pumpkin I bought was only 2 cups. It was a creative experience but fun. I would love to know what frosting tip you used as well. I tried that part but failed and had to spread it on the old fashioned way. Thanks for sharing your cupcake experience and recipes. I love your blog! I made these for my friends and family last week (never visit empty handed), and was amazed; they are perfect. I made a white chocolate buttercream to top them with instead of the cream cheese frosting, but might try them your way next time. Great flavours! Vespa!!!!! Hooray!!!! Neat way to deliver your cupcakes! I love your blog! The pictures are amazing and I love cupcakes! I was wondering where you purchased the liners for the cupcakes? Thanks in advance. Your blog is my new favorite guilty indulgence. 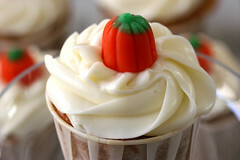 Happy Halloween, killer pumpkin cupcake recipe. hi there! Great work on your blog. I simply love the way you infuse flavours from all over the world into a cupcake. I added your blog as a link on mine. Hope you dun mind. shaz, a fellow foodie blogger. Just wanted to say thanks for the great recipe! These were a huge hit with the husband and the office. This was the first of your recipes that I’ve tried, and based on how delicious these were I am definitely going to be making a lot more! These were perfect!!! Especially loved the frosting and will make these for the coming holidays. Wondering how you get your frosting so white!?! Thanks! oh my gosh your cupcakes are absolutely adorable. there like scrumptious and perfect. I wish I could cook like that!! Hello! I go to your website often to drool over the pictures. It’s one of my favorite sites to visit. I am a big foodie and obsessed with sweets. I would have pie all day (or cupcakes) all day if I could. My boyfriend rolls his eyes when I read your blog, but I don’t care. Also, supermarket cupcakes behind the glass are horribly dry and tasteless. But I didn’t want to get a box of 12 because I would eat them all. On my last day of work last month (I was a food writer for the Pasadena Star-News), my coworkers got me storebought cupcakes, chocolate and vanilla, and I had one for a snack, then two for dinner. Felt so sick and so good at the same time. When I get my own kitchen again, I’ll try my hand at your recipes. I’m in China now, and I guess the Chinese aren’t really too fond of sweets :( That’s how they stay so thin I think. I made these delicious cupcakes yesterday. Wonderful blend of tastes. I couldn’t taste the white chocolate (I think the cream cheese icing covered up its kind of delicate flavour). My cupcakes baked up a bit too soft. Too much oil? Not enough cooking time (I left them in for 30 minutes)? Your icing looks great! I’m guessing you used a very large tip with only 3 or 4 “ridges” in it? Thanks for sharing this great seasonal recipe! These turned out beautifully. I had to use a little whole wheat flour because I ran out of all-purpose after 2 cups, so added about 1/2 C. water. I also made buttercream because I didn’t have any cream cheese. Lovely! Thank you for having this site! We love your cupcake blog and often try out your recipes. The pumpkin cupcakes were a big, big hit. For the frosting we combine a bit of the chai spice from a previous recipe of yours to add into the cream cheese frosting and it was delicious. Our friend ate his in two bites. Keep the recipes coming! I made these a couple days ago, and it was GOOD. Instead of 24 though..I ended up with 36 cupcakes. The frosting was HEAVEN. I would so eat it with a spoon, but its cream cheese and its really not good for you so I ..can’t. :( But this recipe turned out well. I substituted applesauce for the oil and didn’t have nutmeg..so..we put some more allspice in it. There’s still 5 cups of pumpkin in the fridge..the next time I make it, which is like, tomorrow, I shall stick in all five..thankyou for this WONDERFUL recipe. I have a question..I THINK I fill my cupcakes up to 2/3’s of the way full..but when they rise..they don’t even reach the top. They’re kinda like 1 inch in height..perhaps I should fill them up more? Ive tried several of your cupcakes – they are just amazing! Yesterday I made the chocolate and coconut cupcakes and they were a great success once more. Now I would like my frosting to look like the frosting from the pumkin cupcakes – please let me know what you use for the frosting. i need recripes for pumpkin cookies with cream cheese frosting or filling. thank you.. These cupcakes are getting rave reviews! I was afraid when scooping the batter into the cups that they were going to taste too healthy since they were so chunky with pumpkin, but the batter filled out around the meat. Delicious! awwww… the little punkins are just adorable! i have some pumpkin that i need to use up, so this just might be it. thanks for sharing. wahou i’ve never seen your blog before, it’s paradise here! Very good. I did them today, it’s delicious. J’ai hate d’en essayer d’autres ! I wish my cupcakes looked as perfect as yours Chockylit.However, they tasted gr8. Thanks for this lovely recipe. I generally don’t like pumpkins. But just for a change I did give it a try. To top it all my mum just made a ‘Pumpkin Cake for me after she heard about my pumpkin cupcake adventure. Mums can be so sweet. Anyways, thanks for your unique recipe chockylit. wow…love your blog! these cupcakes are so adorable and sound delicous! I used a variation of this recipe for cupcakes to bring to a pumpkin-carving party this weekend, and they were a smashing success. Thanks for posting such a brilliant recipe, I love what you do here! I had to alter it slightly due to being in Germany – I forgot to get veg oil, and all the stores close by 8pm, and the olive oil here (even evoo) is very strong tasting…so I substituted 80% veg oil melted margarine. Single-acting baking powder here, so I added a little more. The 405 flour is more light and airy than all-purpose, but not as light as cake flour…so I added 1TB per cup more to the recipe. And, I used a german small pumpkin – very sweet and mild, so I added less sugar. With all the alterations – these came out very well! I was worried most about the margarine substitute – I know how solids/liquid fats work for baking. They are slightly heavy, I know they’d be a lighter crumb with oil. But the taste – I can’t complain about the faux-buttery taste. They are sweet, yet savory. Very mild hint of pumpkin…you know what the flavor is…but it takes a minute to register. Then you go, “oooOOooo pUUUUuuuumpkinnnnnn” (as my Brazilian roommate did) Kinda has a struesely pumpkin muffin taste. Can’t wait to frost them! I’ll have to make sure the cream cheese frosting isn’t too sweet. These are just scrumptious! OH MY GOD. I’ve made these cupcakes about 4 or 5 times – and they are everyone’s favorite! The absolute perfect cupcake!!! 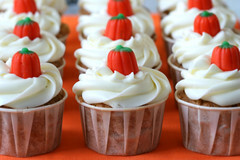 I made these today using pumpkin puree and they turned out great. I have yet to try them with real pumpkin but they were perfectly moist and super delicious! I actually substituted these with butternut squash because it’s may and pumpkins aren’t in season, and they turned out so good! I made half of these pumpkin cupcake recipe today, it was too sweet for me or maybe the pumpkin it self is sweet, should use less sugar. I’ll post it later on my blog. These are my favorite in the world! I can eat them weekly, although my husband “only does pumpkin at Thanksgiving”.. It’s my favorite. I love trying any variation– the more moist the better. Yum! Making these now… substituted gingerbread liqueur for the vanilla. Looking forward to trying them! Holy crap. The first batch just came out of the oven and I ate a warm one. BEST CUPCAKE EVER. Just to say I make these so often during pumpkin season and they go down a treat. Perfect winter baking for lots of hungry boys! Thank you.